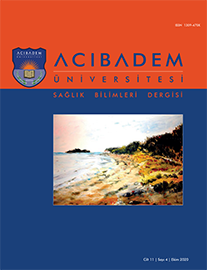 1Amasya Üniversitesi, Sabuncuoğlu Şerefeddin Sağlık Hizmetleri Meslek Yüksekokulu, Amasya, Türkiye 2Erciyes Üniversitesi, Sağlık Bilimleri Fakültesi, İç Hastalıkları Hemşireliği Anabilim Dalı, Kayseri, Türkiye Objectives: The research was conducted as a cross-sectional study to determine moral sensitivities of health care providers who are working in emergency departments. Study Design: The extent of the study was composed of health care providers working at emergency departments of hospitals in the center of Kayseri city, Turkey. Data of research were collected by using questionnaire form and Moral Sensitivity Questionnaire form. Data were evaluated by number, percent, mean, standard deviation, median, Mann- Whitney U test, Kruskal-Wallis analysis and Dunn test. Results: It was detected that 54.1% of health care providers who were working at emergency services, experienced ethical dilemmas, 45.7% encountered ethical dilemmas in the treatment applications, 38.6% stated that they did what was most beneficial for patients in their approach to ethical dilemmas, 67.2% had received training on ethics and it was also observed that health care providers moral sensitivities were improved over those who had not received training in either seminars or courses. Among the healthcare providers, those who specifically chose female health care and had 11 or more years experience had a high moral sensitivity level. In addition, it was observed that the institutions also contributed to their staffs moral sensitivity (p<0.05). Moral sensitivity of health care providers were found middle level [85(70-97)].